Keep perishable groceries perfectly chilled in a freezable ice cooler bag that does the job without needing any extra ice packs. 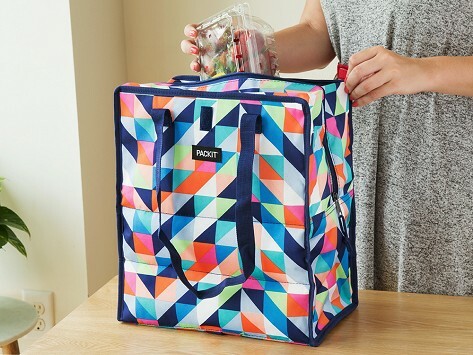 Freezable gel liner built into the fold-flat walls of the bag means it can go straight from the freezer to the farmer’s market and grocery store—and back again—and keep food and drinks cool for hours. Love! Love! Love! these freezable bags. They are attractive, well made and oh so useful. Since they close down to about 1/3 their size they are easy to keep in the freezer without taking up much space. The bags work well too. They keep items cold for a very long time. I purchased one to see what it was and immediately purchased another for myself and one for my friend as a gift. Not only great for grocery shopping, I also use them to transport items I want to keep cool going from one place to another or to a picnic.